If you liked this show, you should follow Accomplish Radio. What happens when two award winning coaches join forces? You get a powerful, dynamic duo with twice the impact! 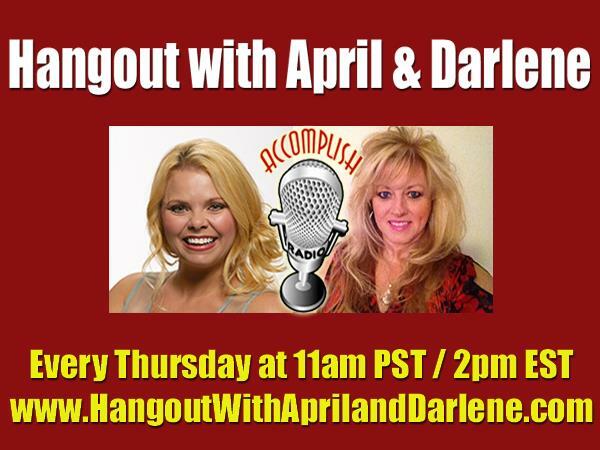 Join Darlene Willman, the host of the Accomplish Radio Show and her new co-host, April Morris Sedun each Thursday for a double take. We’ll be broadcasting the radio show AND streaming video on our Google+ Hangout! We have a lot to talk about and sometimes we’ll have an expert make a guest appearance and join in the conversation. A few of our past topics include the Power of Positive Thinking, Balancing Life & Work, Ways to help you discover your WHY, The Law of Attraction & Manifesting, plus many other important topics all designed to help you ACCOMPLISH more than you ever thought possible.